Sigh. Last night I walked down Edinburgh’s Royal Mile and heard bagpipes in the distance. As I approached the player, he began Braveheart’s famous heart-wrenching funeral song. I shot this while I listened to the bagpiper breaking my heart on the Royal Mile. It’s Giles Cathedral at dusk. It was all too much for me. So Scottish. In a way, Edinburgh is the beginning of the end of this part of my travels. In just 10 days I’ll be back in the land of the free, where maple syrup flows and beavers gnaw. I broke into the ugly cry. Not just because I’m so near the end of this part of things, but also because I don’t want to leave Scotland. I’ve really loved this city, Edinburgh, and I can’t imagine what small towns and other places must be like if the big city has this much heart. 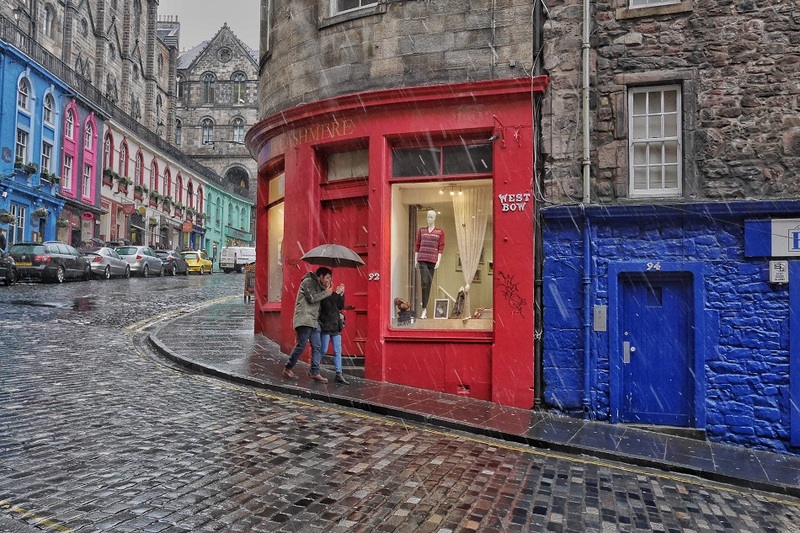 A couple huddles under their umbrella on Victoria/Bow Street in Edinburgh. At times, it felt like I was back home in Canada, I’ve heard the word “Sorry” so much. Thanks, Scotland! Day one, I got my bearings here. 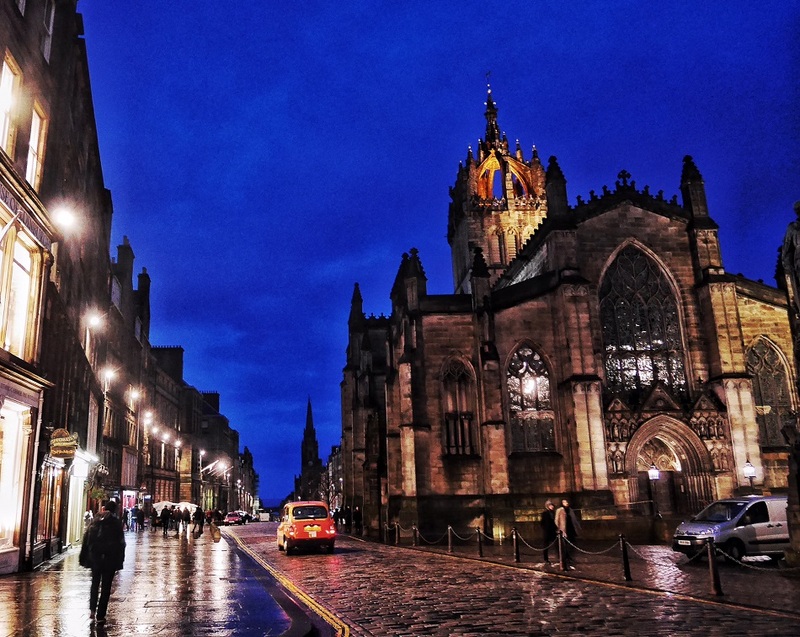 A couple pubs, the Royal Mile, photos galore. Ducking in and out of rain. Generally, just walking a lot and being amazed I was finally in Scotland after a lifetime of wanting to come. On day two, I had a full day. I went out for breakfast in Leith. Spent a half-hour chatting with an old fella on the riverfront. He had led an amazing life (everything from being a seaman in Leith’s heyday to working oil fields in Kazakhstan). I laughed often as he said things like “Ach! Politics is wasted on politicians.” I shot some photos of Leith then decided I wanted to visit Portobello Beach. 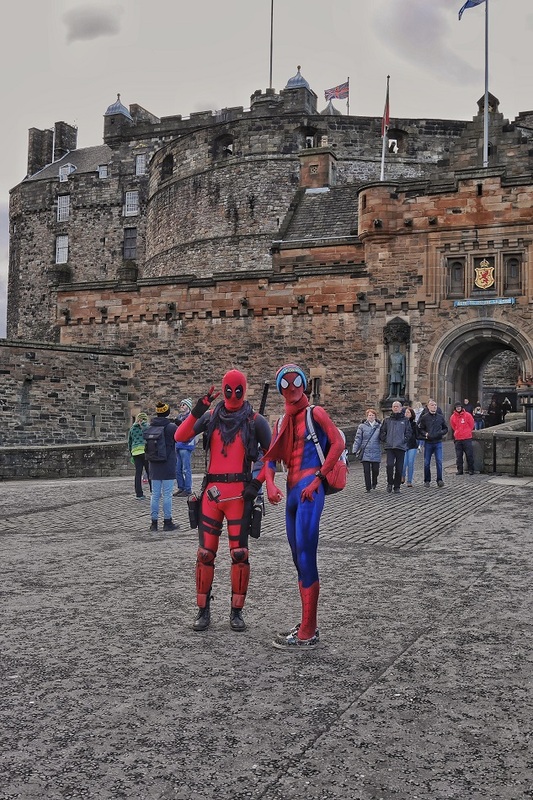 Spiderman and Deadpool hanging out at the Edinburgh Castle, as superheroes do. I saw the most amazing rainbow on the shores of Portobello, then parked myself at a pub table as night fell over the Firth of Forth and the Atlantic. I wrote and wrote and wrote for three hours. When done, a sadness laced with peace came over me because I knew I couldn’t come back there. Not for months, maybe a couple years, but I loved it so much and I wrote so well. It was a special spot. 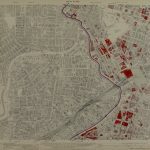 Not wanting to let the day end, I decided to walk the whole five kilometres in the dark back to Leith. It was unnerving in some patches, but along the water, I loved the experience. I was glad to give myself a memory I’ll always call to mind with a proud, quiet smile. My slow, steady pace was matched up the coast by a huge flock of seabirds who kept flying 100 or 200 feet. They’d settle on the water a few minutes, then all fly again. For nearly three kilometres we made our way up the shore together under a moonlit sky. Yesterday, my legs whimpered. The weather was nasty with winds blowing snow and rain through the day. I rode transit more and did photography in short bursts, but got some shots I loved. I did a whisky tasting, ate haggis and sticky toffee pudding. Essentially, I rocked TOURIST STEFF mode for a change. As a result, it was my most expensive day in five months. Except for the bus fare a local gave me when I was short. Aww! But I got no regrets. Eventually I had to go Full Tourist, and it happened in Edinburgh. 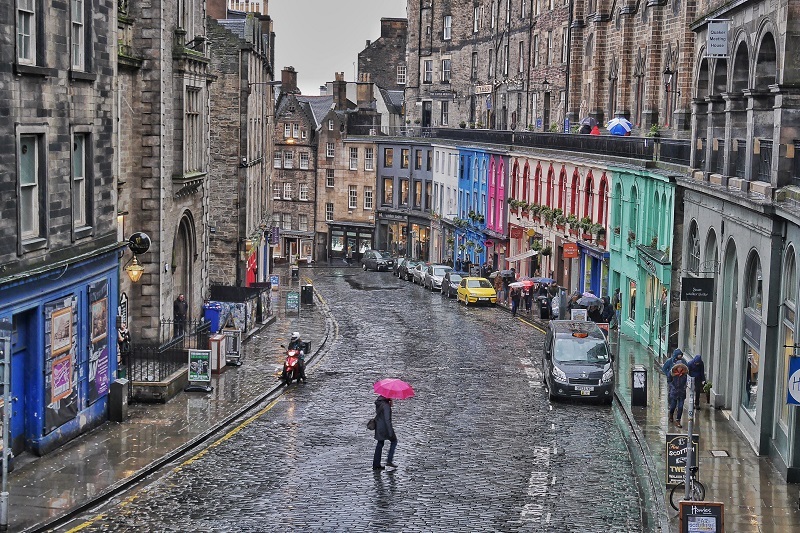 Woman with a pink umbrella crosses Bow/Victoria Street in Edinburgh. This is probably one of my all-time favourite shots I’ve taken. I waited for someone with a colourful umbrella for over 5 minutes in the blowing wind and rain and snow. So happy with the result. Today, I took in the National Museum, an exhibit on Plagues at the National Library, and shot panoramas from Edinburgh Castle. I tried rousing Mackenzie’s Poltergeist at his tomb and did the obligatory Greyfriar’s Bobby shot (I’ll never understand the allure of that). Dining was heavenly as I ate like a queen with a full Scottish breakfast and dinner was Steak and Ale Pie. I even heard Ceilidh music played by eight musicians at the legendary Sandy Bell’s Pub as I drank Orkney Brewing’s Dark Island porter. Tomorrow, it’s off to Manchester, a city I know virtually nothing about. They have a football team, I hear. Sadly, my vacation time is over and I’ll need to cram work into the week too. I’ll see Manchester though, mark my words. And I’ll tell you what I know: I’ll be back in the UK, not once, but often, and I hope to come to Scotland and Ireland and even Wales for as long as six months for a visit so I can really commune with my ancestors and experience the life here. I love the people, their humour and kindness and graciousness. They’re blunt, they’re honest, they’re helpful. I couldn’t be happier to know I share roots with these people. No wonder I’m so awesome. Look where it comes from. Hah! Ahh, thank you, Scotland. You’ve been bloody marvellous. 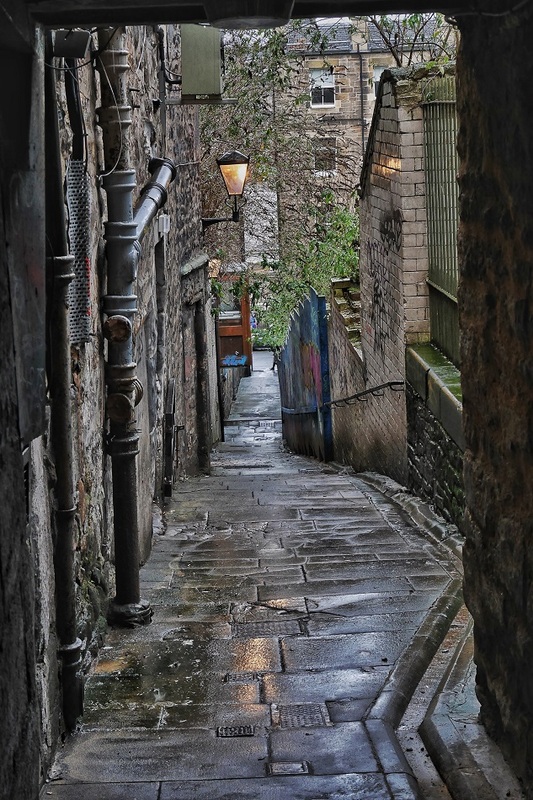 One of the twisting narrow “closes” off the Royal Mile; an alley for pedestrians that generally lead to courtyards but sometimes to streets. I love this! I’m hoping to make it to Edinburgh this year, although its pricey to get there from the U.S. I have a feeling it will capture my heart! Hey! Save yourself some money and buy a flight to London. 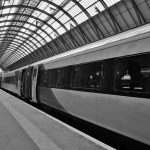 Check train times and prices for getting from London to Edinburgh. The prices change depending on day and time of week, and I went to Edinburgh for about $72 Canadian. (36 pounds, which is, what, $50 USD?). I took Virgin East Coast. If the train is more than 1/2 hour late, you can be entitled to money back, too, so check “delay repay” on the Virgin site if that happens. Weekend trains are most expensive. My flights from Vancouver to London would be about $900 and the trains about $150, but to fly there direct would be $1900. Makes a huge difference. Great post, Steff. I’ve been longing to go back to Scotland, and so enjoyed seeing it through your eyes. Sigh. Only four days! Sad! Thanks though. 🙂 I can’t wait to go back but it likely won’t be till later in 2017. I loved Scotland and totally agree – friendliest people on Earth!